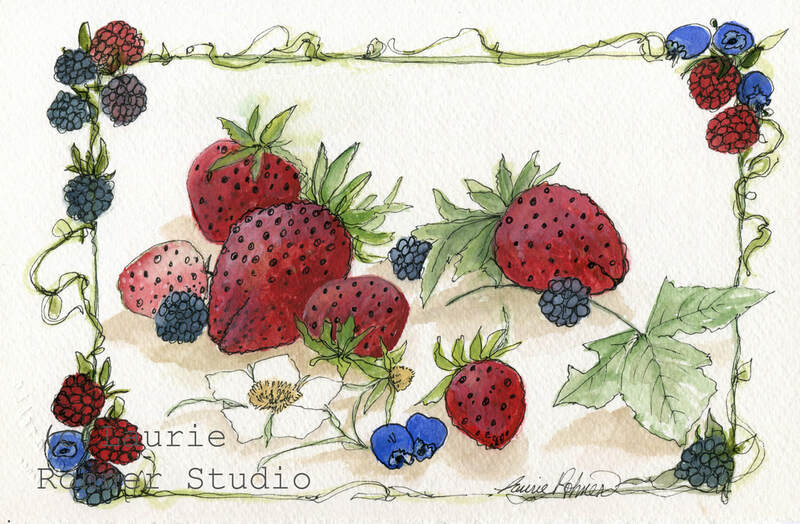 Nature art watercolor painting of strawberries picked in a botanical garden titled Summer Strawberries is original artwork by Laurie Rohner. I love strawberries and don't my strawberries remind you of warm sunny days ice cream and strawberry shortcake. I bought some strawberries at the market the other day and while washing them decided to take a few to paint. Nice on cold winter days or hot summer days hanging in you cottage farmhouse kitchen porch or loft for a touch of whimsy. Wall artwork for cottage chic, farmhouse and loft decor. Image and Paper size is 7" x 10". I ship everywhere and the shipping charge outside the US is for International Flat Rate for Envelopes.